Slips and falls can happen just about anywhere, including grocery stores, parking lots, stairs, and even a neighbor’s home. They may be common accidents, but they can result in devastating and life-changing injuries. At Mesirow & Associates, PLLC, we help people who have been injured due to slips, trips, and falls. If you have suffered a slip and fall injury, you can’t afford to go without experienced legal help. In many cases, slip and fall injuries can take years or even decades to fully heal. In the most serious cases, a person’s life is forever changed due to injuries sustained in a slip and fall. Don’t shoulder the financial burden of another person’s negligence. Get the legal assistance you need now to ensure you’re not stuck paying out of pocket for your injuries down the road. 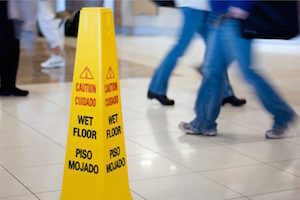 Slips and falls generally fall under the legal theory known as “premises liability.” In premises liability cases, the law imposes a burden on all property owners to look after their property the way any reasonable person would. When property owners fail to maintain their property, or neglect to remove hazardous conditions from their land and buildings, they can be held liable for injuries that result. For as long as entertainment has existed, people have used slips and falls as a form of comic relief. Whether it’s a banana peel or a set of icy steps, watching a person lose control and hit the deck tends to make people laugh. Falls may be funny on stage, in films, or on television, but they are rarely a laughing matter in real life. In fact, falls are a leading cause of death across all age groups and the number one cause of death in the elderly, according to the National Council on Aging. Every year, 2.8 million seniors are treated in emergency rooms following a fall, and 800,000 are admitted to the hospital after a slip and fall. Although some of these falls are accidents, others are the result of a property owner’s failure to remove hazardous conditions from a store, parking lot, or residence. Furthermore, slips and falls can be serious regardless of a person’s age. Slips and falls can also have lingering consequences that forever change a person’s life. The Centers for Disease Control and Prevention (CDC) states that experiencing a fall can make a person more fearful about having another one, which can lead slip and fall victims to avoid exercise and any activities that might result in another accident. If you have been injured in any kind of slip and fall accident, don’t assume that your injuries are not serious, or that you don’t have a case. Some injuries, such as neck and back injuries, take time to develop symptoms. If you delay getting medical treatment, you could overlook a serious injury that will only get worse down the road. The Washington DC slip and fall accident lawyers at Mesirow & Associates, PLLC can speak to you today about your case. We help individuals hurt in slip and fall accidents get the compensation and justice they deserve. Schedule your free case evaluation by calling 866-463-0303.